Decks and trucks get all the glory, but a skateboard’s wheels are the only part that touches the pavement. The best skateboard wheels deliver speed when its needed and traction when its desired, but they should still break into a slide with a slight coaxing. They do not, however, all do these things equally. We list our favorite wheels on the market below, but first, we’ll discuss what to look for in a skateboard wheel. Before we begin our tour of the wheel, let’s take a tour of the Bones factory with this Video. The variables that you need to understand to purchase the best skateboard wheels possible are few. Manufacturers usually group their wheels by formula first, then by size and finally by hardness and shape. Street skateboarding has not changed fundamentally since its inception, and these variables have all been worked out in the ensuing decades to within certain ranges that change very little across the industry. Skateboard wheels are made of polyurethane. The mixture of urethane and its properties in a given wheel are known as its formula, and it has a profound effect on the performance of a wheel. Manufacturers tailor their formulas for different properties, such as longevity or feel. The formula’s characteristics work together with the hardness to give us an idea of how a wheel will feel when ridden so that two different formulas with the same hardness can feel markedly different. Manufacturers normally group the wheels in their product lines by urethane formula. Often, there will be models that share a formula, but sometimes the named wheels in a product line will have their own formulas. There is no standard way of doing it. In modern skateboarding, manufacturers make wheels for either street skating or transition skating, though sometimes their wheels are intended to work well for both. Street wheels work better for park and transition skating than skatepark wheels do for street, however, so if you must choose only one, go with street wheels. The main characteristic that differentiates wheels is their size. The measurement that will make the most difference in the way a wheel ride is its diameter or height from the pavement. Most street wheels have diameters between 50mm and 58mm. Choosing one size or another is a matter of preference, but there are a few things to consider. Diameters around 50mm offer the ability to skate with little fear of wheel bite from the wheel rubbing on the bottom of the deck when turning, but they have drawbacks as well. Smaller wheels cover less ground per revolution, so they are slower and require more pushing. Also, as they wear, they get smaller sooner because they are already starting life as a pretty small wheel. Diameters above 55mm may require the use of riser pads to lift the truck and move the axles away from the board. Otherwise, should the wheels dig into the board, the resulting wheel bite will stop you cold. Taller wheels are faster than their little brothers, however, and they last longer because there is more material to wear away. Street and park wheels normally have rounded edges that curve back to a thinner area that contacts the ground. The section that contacts the pavement is called the contact patch. When this area is small, the wheels break traction easier, which helps with technical skating. Wider contact patches distribute the rider’s weight better, reducing rolling friction and riding a bit faster. Contact patches in street wheels vary from 14mm to 25mm or more. Street wheels are almost always rounded from the core to the lip where they meet the ground. This curve – or profile ­– varies from wheel to wheel. The reason is that the bearings are always roughly the same distance apart, so different geometries are used to give wheels different contact patches. A certain wheel profile may suit your eye but not work for your skating. So, pay attention to the contact patch and ignore profile to get the most out of your wheels. A wheel’s hardness is given as number with a letter behind it, usually an A. This number is found using a meter called a Shore durometer, which is why the resulting number is called a durometer. This device presses a metal needle into the material, and measuring the indentation made at a given force gives the durometer number. This technical spec is used for all sorts of non-metallic industrial materials, not just skateboard wheels. Urethane wheels can be as soft as 78A or as hard as 101A. Street skateboarders usually ride wheels with durometers between 98A and 100A. Harder wheels like these slide easier and resist developing flat spots, which are annoying at best and can ruin a wheel when particularly bad. Some skaters build park setups for skateparks and transition, and they will use softer wheels for this purpose. Durometer is a matter of preference, but most skaters with only one setup use harder wheels. Sometimes, a different durometer scale, such as the D or B scale, is used to give this hardness. These numbers will translate to an A-scale number, and manufacturers usually provide literature to explain the differences. Bones, for example, uses the B scale for its wheels. To find the correlating A-scale number, simply add 20 points to the B-scale number. Transworld Skateboarding magazine explained the durometer scale in greater detail than there is space for here. 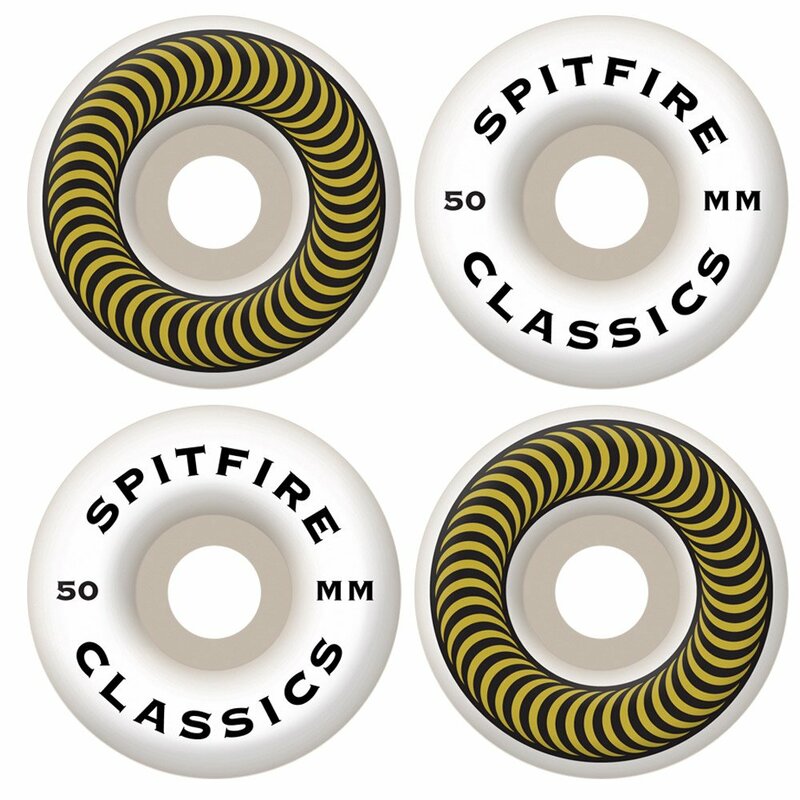 There are five shapes in the series, but the Spitfire Classic shape in 101d durometer has long been one of the most popular wheels in skateboarding, owing to its thinner contact patch. The 53mm diameter version, which is in the middle of the pack of offerings in this shape, has a 16mm contact patch, for instance. The modern style of street skating is geared more toward flow and creativity and less on the high-tech flip tricks of the past, though tech is still prevalent. Riders who prefer to go fast and be stable should consider the Spitfire Formula Four Conical shape with 99A durometer. It is faster and softer for smoothness, though it is more prone to sticking in slides. One of the oldest and most respected names in the business, Bones Wheels continues to produce quality urethane. Bones’ Street Tech Formula wheels are part of a series that comes in two distinct formulas: one for street, one for park terrain. The Bones STF V4 is designed for all-around use. At 34mm wide, it is the widest of the bunch, which makes it a bit faster than the rest as well. It is available in diameters from 51 to 55 millimeters and has an 83B durometer, which matches up to around a 103A hardness. Hard wheels such as these last forever and slide smoothly without ever producing flat spots, but you are always aware they are under you. 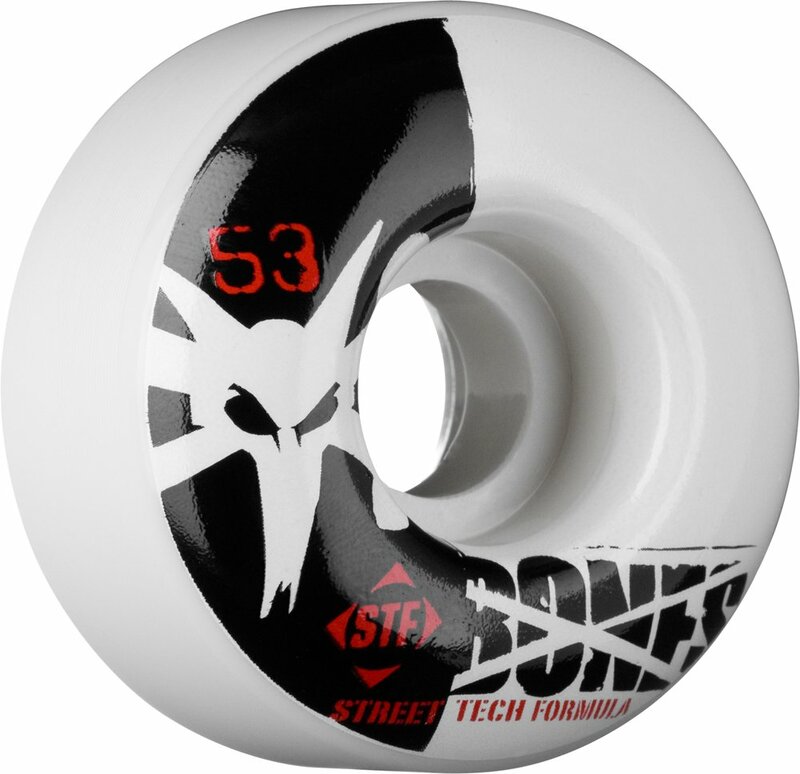 Skateboarders who mostly do technical skating on flat terrain should consider Bones STF V1s for their thinner profile. 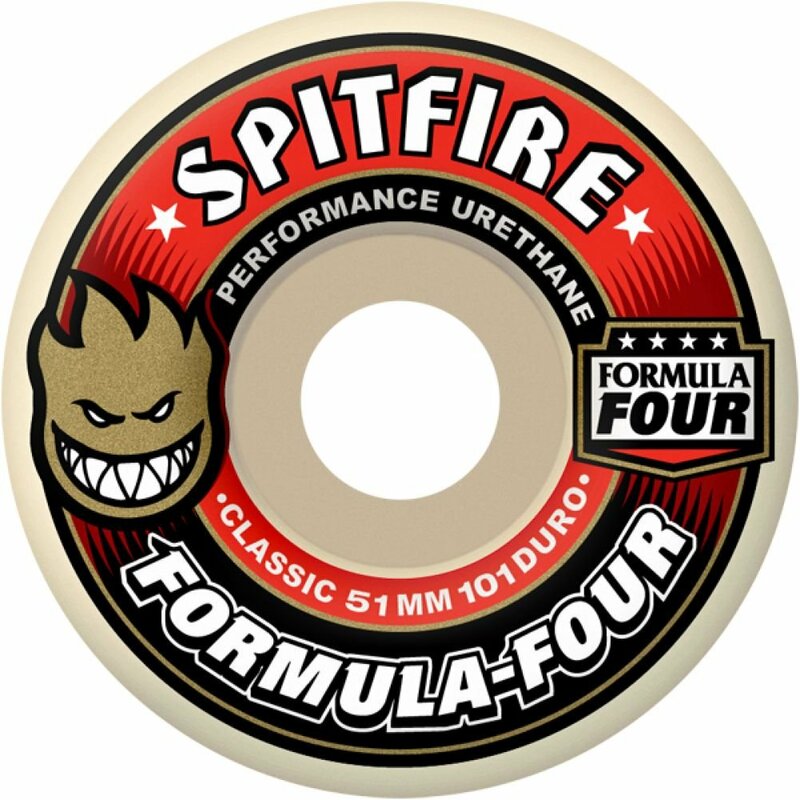 Spitfire Classics have a higher-rebound urethane formula than their Formula Four cousins. Their options for size and shape are a bit limited compared to the more popular compound, but they make up for it in smoothness across all terrains. Park skaters love these wheels for their gummier feel. The Classics feel softer than their 99A durometer suggests they should. Classics come in six diameters, from 50mm to 60mm; the latter of which is seldom used on any terrain except transition. The middle diameters make a great compromise between park and street skating though, and the Classics work well for riders who move from one terrain to the other regularly. The only glaring drawback to the cushier urethane is that these wheels have a slight tendency to develop flat spots. It is not common, but it does happen. Longevity is also an issue with these wheels, and they require replacing sooner than wheels with less rebound. The Mini Logo brand is a division of Powell, and it makes affordable gear for skaters on a tighter budget. 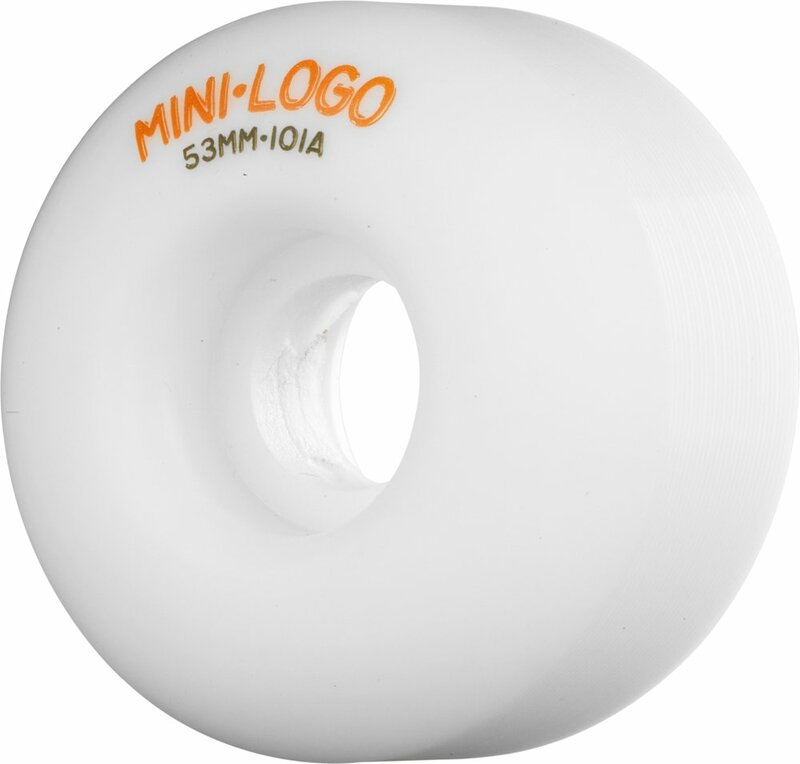 Mini Logo’s C-Cut wheels are manufactured specifically for street skateboarders, as they have the classic tapered profile that works down to a thinner contact patch. They are made with a super-high-rebound urethane formula that makes them feel relatively compared to other wheels of a similar hardness. The Mini Logo C-Cuts with 53mm diameter are a thin 32mm wide. The 101A durometer feels more like a 99A in a premium wheel, but they are hard enough to kick into slides easily. They are available in a variety of colors, though the white ones feel a bit harder than the colored ones because the pigment alters the formula just slightly. Skaters who skate transition and park terrain often might consider the Mini Logo A-Cuts, which are larger and have wider contact patches. Mini Logos are not a premium wheel, and a skater will never confuse them as one. They are affordable for a reason, and their urethane lacks the density of some of Spitfires higher-priced wheels, which is a double-edged sword. They are light, and a skateboard will feel noticeably lighter with them affixed, but they do not last very long. If you’re in the market for wheels and you don’t have a lot of money, though, Mini Logo wheels deserve your attention. Autobahn has outlived its reputation as the new kid on the block, having stayed strong in the competitive business of wheel manufacturing since 2001. (Check out this Video welcoming Carlos Ribeiro to the team in 2014) It owes its success to beginning the tech revolution in wheels that now dominates the market. However, its most successful wheels are some of its simplest. The Autobahn Nexus is a basic street wheel. It has a durometer of 100A, which is a rarity, and uses the company’s ab-S urethane formula. The ab-S is a simple pour of urethane, and it produces a classically hard roll that is easy to slide on obstacles or pavement. There are several diameters available, with the 51mm being the most popular. The simplicity of the formula helps make the Nexus one of the most affordable wheels from a big-name manufacturer. They will not win a head-to-head race against some of the specialty pours on the market, but they are plenty fast enough for most riders, especially beginners. They utilize Autobahn’s standard shape, which is the classic street wheel shape. 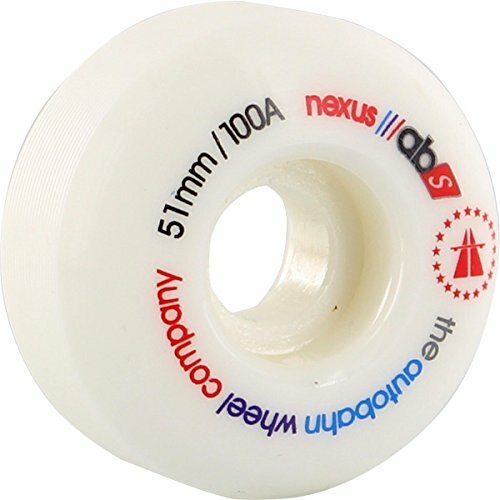 The Nexus is a good wheel for street riders, but may be a little hard for transition, especially Masonite-covered wood. 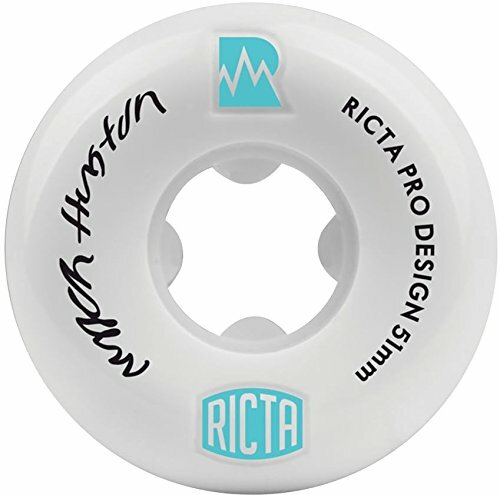 Ricta made its name in skateboarding with cored wheels in the 2000s. Cores proved to be a bit too fragile for the rigors of street skating, but the Ricta name perseveres thanks to the company’s skate-proven urethane. This Ricta Video shows its team cutting up, and also the results of some empirical tests the company did of its NRG wheels. The biggest name on Ricta is Nyjah Huston, who rips street courses up, so of course he has his own NRG wheel. Ricta’s NRG Nyjah Huston model is 51mm tall and 27mm wide, with a 16mm contact patch. It has a durometer of 81B — or 101 in the A-scale. However, the relative hardness is not quite as rock-like as the durometer would lead you to believe, as the NRG series uses a high-rebound formulation for the urethane. The NRG works well on street or park terrain. As mentioned, Ricta pitted the NRG against some of the best skateboard wheels on the current market, and it outperformed its competitors in every measure. Of course, Ricta’s big win does not mean the others are terrible wheels, as the differences were not as severe as Ricta would have us believe. They are up there with the longest-lived and fastest skateboard wheels available, though, whether they eclipse the others by far or not. So what are the Best Skateboard Wheels for you? Most skateboarders take wheels for granted until there is an issue. Whether it’s a flat spot that starts to blurt on the pavement or that one coned edge that never comes back to round, wheels are rarely noticed otherwise. They should melt into the background when you skate. It’s a shame that we don’t pay more attention to them, though, because they are our connection to the earth when we ride, and they can make or break our skating experience. The current consensus for the Best Skateboarding Wheels is the Spitfire Formula Four. It has been doing its thing for years now, and Spitfire keeps churning out new shapes, sizes and pro models. Spitfires are fast off the shelf, and Formula Fours stay that way for a long time. They save skateboarders money, which we can then use to replace broken bearings and bolts. If you can’t find a Formula Four that suits your skating, you should probably get a longboard.